Small Business Saturday. Despite the name, KC's #ShopSmall movement is huge. Local makers and retailers will be out in full force this Saturday to help you attack your shopping list and keep the money in KC. We love this little shop for bringing art and chocolate together. Each piece of handcrafted chocolate is carefully airbrushed creating a variety of colors and flavors that range from Venezuelan Spice to Lavender Carmel. The chocolates can be purchased individually or in 4, 9, 16, 21, and 48-piece customizable collections that make for the perfect holiday gift. It’s local, it’s creative, it’s delicious, it’s chocolate. What’s not to love? Hammerpress blends urban, old fashioned and art into a one of a kind experience and has a mix of antique magazines, typewriters, modern screen printing, holiday cards, posters and notepads. The designers at Hammerpress are quintessentially local and have designed for Boulevard, The 18th Street Fashion Show and others. This weekend, print products are 30% off. Owner Peregrine Honig knows how to pick lingerie and swimwear that makes you (or your significant other) feel like a million bucks. Don’t be shy; she knows her stuff! This store has virtually anything you’d ever need for your dog or cat, plus a DIY bathing station. You and your furry friend will be warmly greeted by staff and Rusty, the Shop Dog. This irreverent shop bills itself as "The Greatest Store in the Universe." And it probably is. Started in Iowa, Raygun gives the Midwest some love with hilarious and snarky t-shirts ("This Is My Shopping At Hy-Vee Shirt" and "I lived in Kansas City before it was cool") and unique gifts featuring our regional pride. Normal Human's a great spot to hit if you're looking for gifts that have both class and personality. This shop, nestled in the heart of the River Market, makes great suits. But they also carry a lot more for the well-dressed man in your life. Think sweaters, pocket squares, Sandlot leather goods and Sock 101. Sometimes, it’s tough to tell what’s for sale and what’s just part of the vintage urban décor. Plenty of KC tees here, but also cool prints, antiques and other goodies by local makers. Billing itself as a modern general store, Urban Provisions carries a rotating selection of locally made products. Grab a little bit of everything: they carry candles, purses, cocktail supplies, jewelry, decorations, and much much more. If it's made in KC, it's here. This holiday season, go for something different and give the gift of amazing locally butchered meats. You could pick up anything from chorizo sausage to a whole duck, from farm fresh eggs to lamb bacon. And it's all locally sourced and humanely raised. The West Bottoms is rapidly changing for the better. 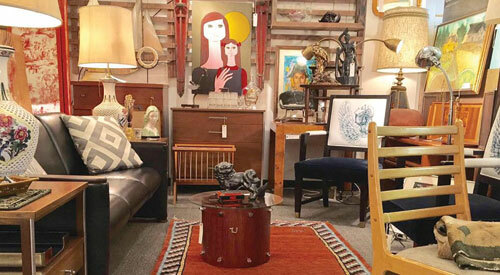 No longer home to only haunted houses, the district now has tons of antique stores and other small boutiques open year-round (not just on First Fridays). Highlights include Bella Patina, Goldie & Myrtle's, and more. Mid Coast Modern is one of our favorite first stops for shopping local. 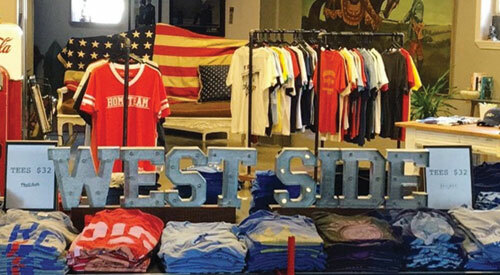 These guys have some of the best KC brands, including their own, and several great regional products as well for a diverse, curated selection of local apparel and goods. Yes, it's a restaurant. It's also a grocery store. But The Sundry features so much local goodness it's hard to not include it on this list. Check out all the local food from greats like Glace, Crane Brewing, Wood+Salt, and Shatto, take a class on cooking, and grab a meal from the kitchen (the specials rotate daily). You’d expect to find it in the West Bottoms, but Urban Mining is a monthly vintage shop in the middle of Westport. It’s not so much dusty attic charm as it is interesting architectural elements and mid-century modern style. A staple of the local clothing scene over the past few years, Charlie Hustle finally has permanent digs on the Country Club Plaza. Get a luxurious t-shirt supporting your favorite city (the KC-in-a-heart shirt is massively popular these days), your favorite sports team, or even your favorite KC barbecue joint. Shopping for someone a little more stylish? Head to Volume 1ne in Westport for what they describe as "lifestyle streetwear." Designer jackets, the latest trendy snapbacks, snazzy shoes, and more await you in this über-hip shop. Bunker's a great time, whether you're shopping or just visiting. Since 1997, it's carried the most interesting, quirky and stylish gear in KC - one of the few places where you can update your wardrobe and get gag gifts for the entire office in one trip. Standard Style is a first rate women's boutique with designs from Phillip Lim, Rag & Bone, Baldwin Denim and many others. Baldwin Men's Shop features the local Baldwin clothing line most known for its knock out dry denim and iconic KC hats. Yes, this is a toy store, but don’t think you’re immune to its charms just because you’re technically an adult. Zoom has so many cool things for people of any age, and it’s not stuff you’ll find at a Toys"R"Us. Six local potters have come together to open this new shop/studio space right next to Oddly Correct in Midtown. Functional pieces and more artistic ones abound, so get shopping. Mash Handmade is a whimsical little shop in Westport run by a mother daughter team. The shop specializes in handmade goods for the home, however it also carries a large variety of jewelry, art, clothing and children’s toys as well. The shop works with over 30 artists, mostly local, to bring a unique and constantly changing collection of work under one roof. One of the last great comic book stores, Clint's has been bringing comics, collectibles, and more to KC since 1967. Set aside a few hours to visit this mainstay of Midtown; it's overflowing with goodies from DC to Marvel, from Star Wars to the Walking Dead. Used books piled high. A basement of old paperbacks and a shoe chair. A recently renovated attic full of vinyl records and a performance space. Prospero's has been a West 39th Street staple for decades, and for good reason. The 100-year-old building houses thousands of books and a truly unique artistic experience. Waldo's "Shop Small Saturday Crawl"
The Waldo “Shop Small Saturday Crawl” is a must on Saturday. The event goes from 10-4 on the 25th, but shops will have specials all weekend. Pick up a “passport” to carry from shop to shop and, at the end of the crawl, qualified passport carriers will get $10 free Waldo bucks and other prizes. Win or lose, you’ll win. Shop Season + Square’s selection of more than 100 spices or other stuff for your home. They focus on small-batch and local manufacturing using reclaimed or up-cycled materials. Buy into their “6 for 60” deal (six wines for $60/month) or swing by for a tasting. You’ll also be tempted by craft beers and chocolates. It’s better to go in without an exact idea of what you’re looking for. Whatever cool thing you find, you also leave knowing you’re supporting local artists and charities, which is all part of STUFF’s mission. Formerly Frankly Basic, Twill is a KC local women's boutique with lots of top brands and a whole bunch of personality. This is the kind of place you might end up if you are looking for a really special piece to wrap this Christmas. At Twill, its quality over quantity and that's what make them really special. This accessories truck on wheels has a new store in Leawood. You’ll find all kinds of sparkly stuff, including a highly coveted gold KC skyline necklace. Founders Nicole and Jessica curate their Park Place shop by requiring that all their products be free of the TOXIC TEN, or chemical ingredients that could have negative health effects. You’ll find KC brands like Hammerpress, Ocean & Sea and MADI Apparel at Hand & Land, along with a slew of others. Started as a conduit for local makers and artists, Made In KC now features goods from over 100 vendors. Stop by one of their many locations and pick up soaps, coffee, candles, shirts, wallets, socks, or even tea for your loved ones. A few things on the shelves of the General Store & Co. might make you blush. Beyond irreverent stocking stuffers, go here for modern, well-crafted housewares, and unexpected kid’s stuff. This independent bookstore has been around since 1975. In addition to being a fantastic bookstore with excellent service, Rainy Day Books also hosts author events with big names like Megyn Kelly, Alton Brown, and George R. R. Martin. What started as a small leatherworking hobby has grown into one of the trendiest jewelry shops in KC. Sporting unique leather-and-metal earrings and jewelry, Nickel & Suede just opened a brick & mortar shop in Liberty. You probably have some of their work on your Pinterest page. Shop Ampersand for colorful, bold graphic prints, T-shirts and accessories. The Sandlot team could really use support this year as they're rebuilding from a little accident (a car smashed through their store). Their products, crafted from top notch leather, are some of the most iconic in KC. Shameless plug, we know, but we carry a lot of our favorite local brands and designers in our shop as well. Have a look and, wherever you shop, #shopsmall.